Rediff.com » News » Was cop killed for his role in probing Dadri case? 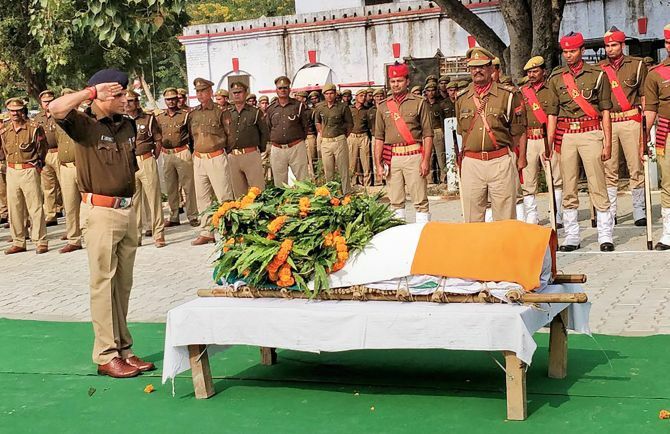 Slain police inspector Subodh Kumar Singh's sister has alleged that her brother was murdered because he was investigating the Dadri lynching case. Singh was killed on December 3 by a violent mob incensed over cow carcasses in Bulandshahr. The inspector's sister has alleged that her brother's murder was a conspiracy hatched by the Uttar Pradesh police. Mohammad Akhlaq was lynched by a mob on September 28, 2015, in Dadri, Uttar Pradesh, after he was accused of slaughtering a cow during Bakri Eid by villagers, a murder that then shook the nation. "Subodh Kumar had arrested all the accused in the case," Yusuf Saifi, the lawyer for Akhlaq's family, tells Rediff.com's Syed Firdaus Ashraf. What is Inspector Subodh Kumar Singh's connection with the Akhlaq murder case? He was the investigating officer in the Akhlaq case. He had investigated this case in the initial days. I have no idea why he was, all of a sudden, transferred to Varanasi. As far as Akhlaq's murder case is concerned, the charges have not been framed against the accused and all of them are out on bail. Charges have not been framed even three years after Akhlaq's murder? Yes, the chargesheet has not been filed yet. The accused in the murder gave a discharge application and (a lot of) time is wasted over this procedure. Therefore, charges could not be framed. As the investigating officer in the Akhlaq murder case, what was Singh's role? Subodh Kumar had arrested all the accused in the case. There were 10 of them initially and all of them were arrested by him. He had taken all the action that had to be taken against the accused. He had recorded the statements of witnesses and complainants under Section 161 of the CrPC (Criminal Procedure Code). Singh had a key role as the investigating officer in the Akhlaq murder case. After all, the private witnesses (Akhlaq's family members), Singh was the first key witness from the government side in the case. He was the Number 1 witness. I don't recall the exact date, but I think soon after a month after Akhlaq's lynching, he was transferred. Whom did he arrest and how? Singh arrested many accused in the case who were on the run. He also arrested many people from different locations, like someone from the bus stop or some people from their villages. Do you feel his murder is related to Akhlaq's case? I cannot comment on this issue, but I can only say that he was the main witness in the case from the government side. He arrested around 10 out of 18 accused when he was the investigating officer.